Lewisberry celebrates its walk-off win. It’s safe to say 12-year-old Chayton Krauss had never before caused 46,000 people around him to erupt into screams of euphoria. 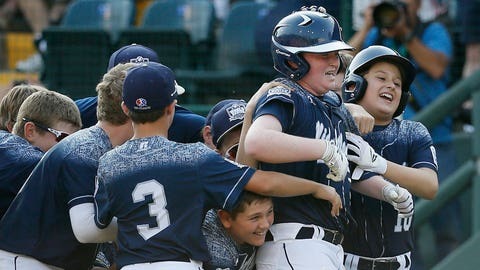 Krauss hit an RBI single to right field in the bottom of the sixth inning Saturday, giving Lewisberry, Pennsylvania, a 3-2 victory over Pearland, Texas, and a berth in the Little League World Series championship game. "It felt awesome and it was amazing to get that hit and it felt great," he said. "I just remember that he had a decent fastball and decent curveball and I got a fastball and just drilled it." Krauss drove in Braden Kolmansberger, who had walked and moved to third on Jaden Henline’s one-out single. The Red Land fans were already lining up for the game at 6 a.m. for the 3:30 p.m. start, helping set a single-game attendance record of 45,716. They quickly filled the large hill behind the outfield fence, leaving only a small patch behind a television tower for kids to participate in the traditional hill sliding on cardboard sheets. Dozens were left to peer through a parking lot fence above the hill. "As far as you could see there were people," said Lewisberry manager Tom Peifer. "They were loud. I kept saying, `Let’s give them something to cheer about.’"
Wagner did that with an opposite-field homer in the bottom of the first inning to give Pennsylvania a 1-0 lead. But Texas used some timely base running to tie the score in the second. Zack Mack doubled and Tristen Schwehr singled to put runners on first and third. Pinch runner Raffi Gross scored when Schwehr stole second base and the throw to second careened off Wagner’s glove as he tried to cut it off. The Pearland team took a 2-1 lead in the fourth when Marco Gutierrez doubled to right-center field. That scored Mack, who came all the way around from first base after walking. "We try to get them to block out the fans," Pearland manager Andrew Soloman said. "It’s pretty amazing that they’re 12 and 13 and they can block it out and play at this level on this stage. (I’m) just really proud of what they did on the field and off the field all tournament." Henline, who had a walk-off double against California earlier in the tournament, hit a home run into the sea of screaming Red Land fans sitting behind the right-field wall to tie the it at 2 in the bottom of the fourth. Wagner received a standing ovation when he came out after striking out the first two batters in the sixth inning and reaching the 85 pitch limit. The 12-year-old lefty struck out 11 and threw 59 strikes before being replaced by Henline, who got Mack to pop out. 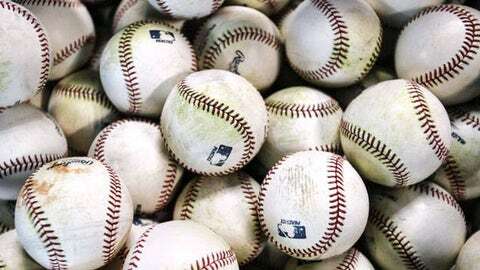 Ryan Farmer threw five innings for Texas, whose three top pitchers were unavailable after being used to make it through the losers’ bracket after falling to Lewisberry 3-0 earlier this week. Farmer, mixing some off-speed stuff with his fastball, struck out six and gave up just two hits, the Pennsylvania home runs. He was replaced by Gutierrez after walking Kolmansberger to open the sixth. Gutierrez struck out Wagner, who came into the game batting .625 for the series, before giving up the back-to-back hits to Henline and Krauss. This was Pearland’s third trip to the Little League World Series since 2010. All three times, it has lost to the eventual U.S. champions. A Pennsylvania team had not won the U.S. title since a team from Shippensburg did it in 1990 and has not won the World Series title since Levittown accomplished that feat in 1960. "It was awesome just to get here," Krauss said. "Now that we’re in the championship game, it’s just an awesome feeling."